Intel’s Skylake Core i7 NUC is talented across the board. Intel’s latest Next Unit of Computing (NUC) mini-PC shares just two traits with its dual-core, square-brick siblings: It follows the same unpronounceable naming structure, and it’s an ultra-compact PC that can do real work. The Skull Canyon NUC (front) with the Intel NUC5i7RYH (top rear), Gigabyte Brix GB-BXA8-5557 (middle rear), and Zotac Zbox CI321 Nano (bottom rear). Its hardware also veers from the expected course. Stuffed inside is a beefy quad-core processor with top-of-the-line integrated graphics, meaning you can run content-creation tasks in more acceptable windows of time, and you can also play fairly recent AAA games at 1080p on this little machine. And yes, that’s at reasonable framerates. The former king of the NUC mountain hasn’t just been dethroned. It’s been kicked so far off a cliff, someone needs to scrape its remains off the ground. Predictably, the kind of performance that Intel packs into this NUC doesn’t come cheap. The list price for this bare-bones system is $650. Our review unit, which came equipped with a Samsung 950 Pro M.2 512GB NVMe SSD and 16GB of Crucial DDR4/2133MHz memory, totals just a little over $1,000 at current street pricing for hardware alone. Add in the cost of the Windows 10 license we used for testing, and we’d be over Intel’s target of $1K total for the build. To hit that mark, you’ll have to spend less on parts to afford Windows, or go Linux. For that bare-bones $650, you get a 2.6GHz Core i7-6770HQ quad-core Skylake processor that can boost up to 3.5GHz, Iris Pro Graphics 580 sporting 128MB of eDRAM, and a whole bunch of cutting-edge hardware. Two M.2 slots support SATA 6Gbps and x4 PCIe Gen 3 (AHCI or NVMe) drives in either a 42mm or 80mm length, with the option to run two drives in RAID 0 or RAID 1. An Intel Wireless-AC 8260 card features 802.11ac 2x2 Wi-Fi, Bluetooth 4.2, and Wireless Display 6.0 support. Two SO-DIMM sockets can take up to 32GB of DDR4/2133MHz RAM, or even overclocked DDR4 RAM. Headers are accessible underneath the user-replaceable lid for NFC, two USB 2.0 ports, and two USB 3.0 ports. As with the Broadwell line of NUCs, you can use plans provided by Intel to design custom lids and make use of these connectors. If you don’t like the skull-embossed lid, a plain black lid comes with the system. You get a VESA mounting bracket and multi-country AC plugs in the box, too. On the outside of the NUC6i7KYK’s 8.31 x 4.57 x 1.1-inch (211 x 116 x 28 mm) chassis are a bevy of ports. (A note about that case: While the new form factor looks sleeker, its plastic shell makes it feel a lot less indestructible than its square-brick siblings.) You get three standard USB 3.0, one charging USB 3.0, a SDXC slot, gigabit ethernet, a 3.5mm headset jack, a combo rear speaker/TOSLINK jack, a Kensington lock slot, mini DisplayPort 1.2, and HDMI 2.0 with HDCP 2.2 support (aka the ability to play copy-protected 4K content). An infrared receiver comes embedded in the front of the system. A USB-C port supports Thunderbolt 3 and 10Gbps USB 3.1, as well as DisplayPort 1.2. 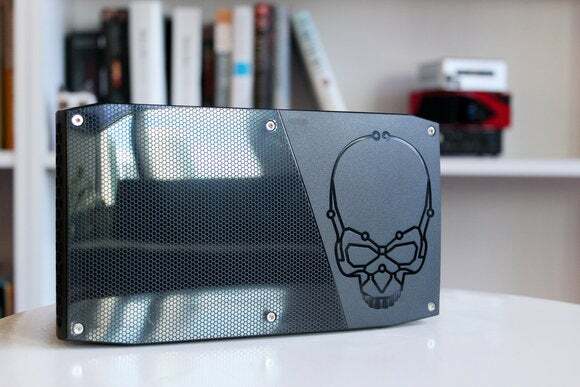 Arguably, the Thunderbolt 3 support is a marquee feature of this Skull Canyon NUC—its implementation helps Intel bill the NUC6i7KYK as a gaming machine. Yes, Intel has positioned this machine as a mini-PC designed for gaming. 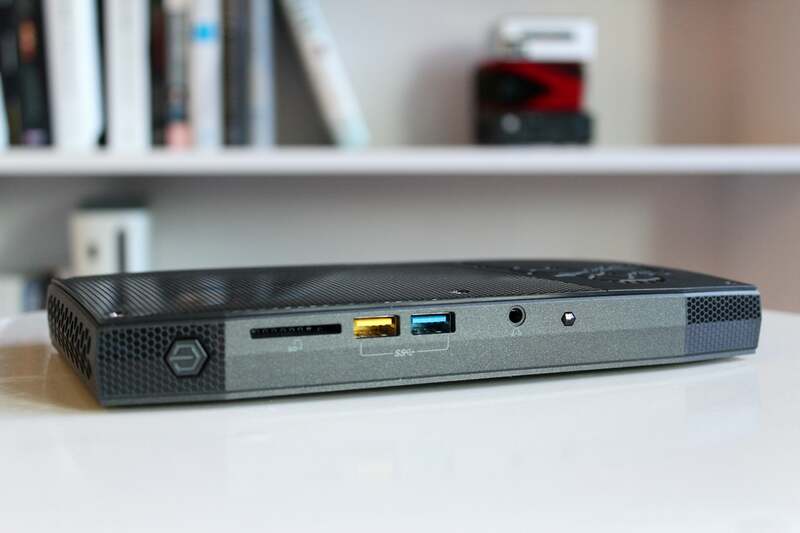 It’s the first NUC the company has touted this way, and the approach is two-pronged: superior integrated graphics on one side, and the dangled promise of using an external video card over Thunderbolt 3 on the other. Selling a general premise of gaming is a curious gambit. PC gamers with full-tower rigs would never dream of abandoning ship for a system whose size greatly constrains (and inflates the price of) performance. Even people playing on much humbler hardware would be giving up a lot. If you take a quick look at 3DMark’s publicly available scores for its Sky Diver test, which simulates 1080p gaming on Medium settings, you can get a rough idea of the gap that still exists between the best integrated graphics and the budget end of current discrete graphics cards. While CPU performance can affect game performance, zeroing in on Sky Diver’s Graphics score (instead of its Overall score) should minimize that influence. Because 3DMark’s compilation of scores aren’t performed on the same machine, and some cards are overclocked to varying degrees, I also ran 3DMark Fire Strike (which simulates 1080p gaming on Ultra settings) on the Skull Canyon NUC and the Nvidia GTX 750 Ti to grab a little bit of data under more controlled circumstances. As you can see, there’s a long way to go before integrated graphics can handle Ultra settings. Even the 750 Ti itself can't make it, but it gets a heck of a lot closer. Briefly put, if someone needs or wants a system with a dedicated graphics card (be it an Nvidia GTX 750 Ti or an AMD Radeon Fury X), the Skull Canyon NUC isn’t worth consideration. Those gamers aren’t the right group for this mini-PC, and it’s odd that Intel didn’t narrow the focus of its marketing campaign to avoid their questions and confusion. Intel will argue that you can get better performance by buying a Thunderbolt 3 cabinet, installing a discrete graphics card, and then plugging that complete unit into your Skull Canyon NUC. That would provide a way to play the latest releases at 1080p/60fps on Ultra settings. The problem is that Thunderbolt 3 cabinets haven’t really filtered out into the wild yet. The Razer Core was slated to launch in April, but as of this writing, it's yet to appear. So while I’m eager to see how this NUC would perform with an external video card, that’ll unfortunately have to wait. For the moment, what makes more sense is the NUC6i7KYK as a gaming machine for people who don’t care about a big blockbuster’s framerates or looks. Instead, they want a portable workstation or a very high-end, compact HTPC that can still run a fairly recent AAA game at 1080p. In this context, “run” means framerates above 30fps, which is playable if not all that fast. It also means dropping graphics settings down a lot, or even to rock bottom. Believe it or not, some people actually wouldn’t mind these limitations, given that Steam’s most recent survey (April 2016) shows quite a few users are rocking integrated graphics. In exchange, they’d get framerates like 35.13fps in Shadow of Mordor or 50.79fps in GTA 5. Honestly, these numbers are pretty exciting, given what integrated graphics achieved on the Broadwell NUCs. 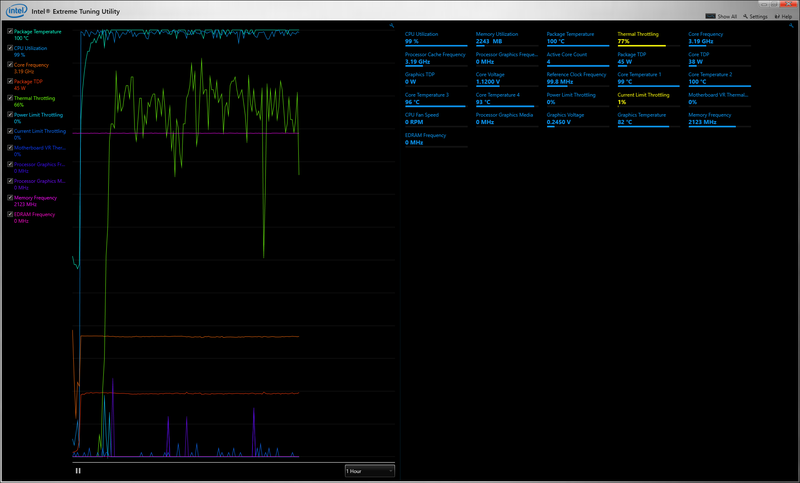 Even non-Iris graphics on the Core i7-6700HQ aren’t all that spectacular. In three-year-old games like BioShock Infinite and Tomb Raider, the older mini-PCs put up a valiant but futile struggle to show playable framerates, and the i7-6700HQ’s Intel HD 530 still gets trounced by the Iris Pro 580 in the Skull Canyon’s i7-6770HQ. Because the older mini-PCs couldn’t take much more stress, these charts show framerates for each game’s lowest settings. 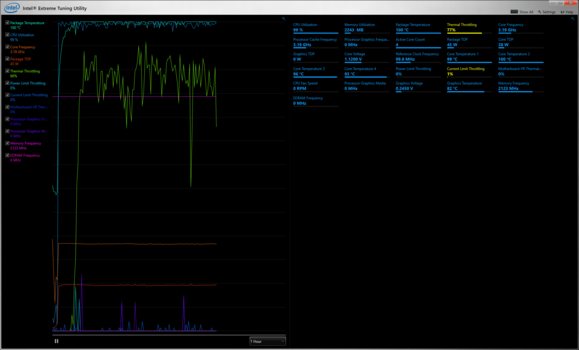 You can play with prettier graphical settings on the NUC6i7KYK, though. At 1080p, BioShock Infinite hit 38.39fps on Medium and 32.75fps on High, and Tomb Raider reached 61.2fps on Normal and 40.8 on High. When you look at those numbers, it’s pretty impressive to see just how far integrated graphics have come. Make no mistake—this mini-PC is also powerful for non-gaming purposes. As with gaming performance, plenty of people will misunderstand the point of buying a system this small, and say that for the same budget, you could build a full desktop or buy a laptop that includes a display, keyboard, and trackpad. However, you can’t put a laptop or a full desktop into the front pouch of your backpack, and they won’t weigh 1 pound, 5.8 ounces. So let’s talk instead about how fast this machine is for something so compact. In our PCMark 8 benchmarks, the NUC6i7KYK moved along briskly during the Work Conventional test, which simulates office tasks like spreadsheet entry, word processing, and video chatting. It netted a score of 3,458. These kind of activities aren’t very challenging—even systems with less powerful CPUs can manage decent performance. More interesting was the NUC6i7KYK’s score of 3,759 in the Creative Conventional test, which includes more intensive tasks like video editing. As its PCMark 8 Creative Conventional score suggests, this tiny computer can realistically be used for content creation. The results of our Handbrake video encoding test, which involves converting a 30GB video file (MKV) into a smaller MP4 file using the Android Tablet preset, show this more clearly. 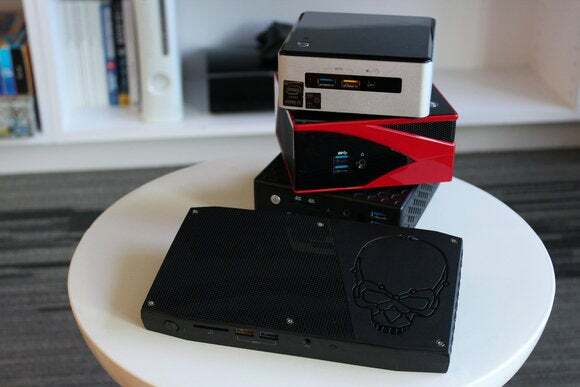 The Broadwell NUC was one of the fastest mini-PCs with an encode time of 1 hour and 41 minutes—and the Skull Canyon NUC screams past it with a time of 48 minutes. That’s slightly faster than the socketed Haswell part in our PCWorld Zero Point desktop system. Granted, Haswell was two generations ago, but look again at the size of the Skull Canyon NUC. Intel’s engineers cooked up some voodoo magic to coax this kind of performance out of a machine the size of a VHS tape, especially when you look at the temperature the NUC6i7KYK hits under full load. I typically don’t see processors sustain 100°C for extended periods of time, much less for nearly the full 48 minutes of our Handbrake encode test. As shown in this screenshot, some thermal throttling does occur, but the stock clock speeds barely drop—maybe by about 0.1 to 0.2GHz. When asked, Intel indicated this isn’t abnormal behavior for the Skull Canyon NUC, and this temperature level isn’t a cause for concern. So if you happen to notice your NUC6i7KYK’s processor sailing along at the boiling point for water, it should be fine. About the only downsides to the NUC6i7KYK are its power consumption and how loud it is, and they’re not even that bad. 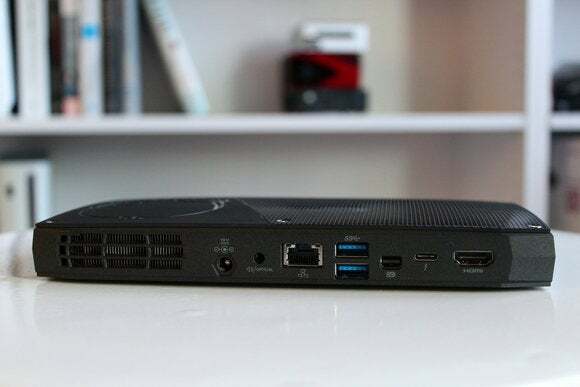 Compared to the similar complaints I had about the Broadwell Core i7 NUC, the peak power draw of 72.1W under load seems more reasonable, especially given how much performance this Skull Canyon NUC delivers. 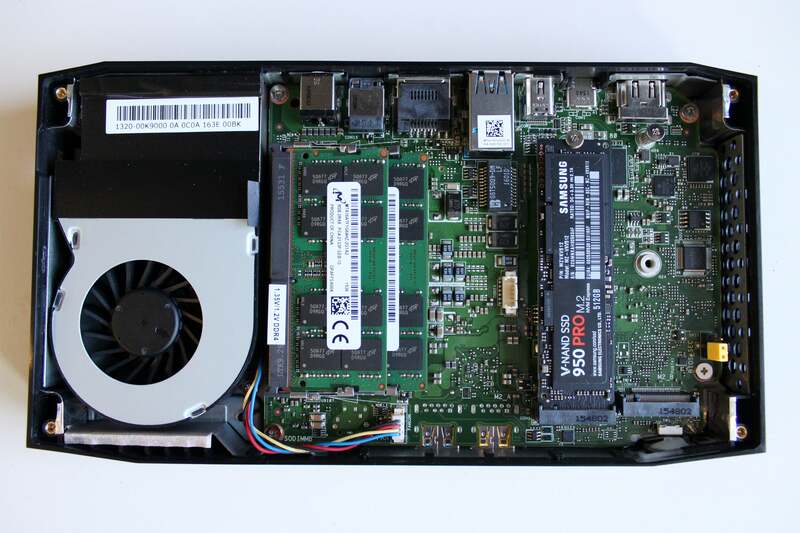 And the fans are quieter than the Broadwell NUC’s—they’re on par with a slightly noisier laptop. If this Skull Canyon NUC is any indication of where Intel wants to push the form factor, mini-PC enthusiasts may have a golden future ahead. Even though I’d personally hesitate to categorize this system as a gaming machine, its performance is excellent across the board. The idea that the next Core i7 NUC could do even better is exciting. That said, Intel told us there’s no set plan to produce a direct successor to the NUC6i7KYK—rather, that will depend on how well it sells. There are potential challengers to this tiny system: Gigabyte could update its NUC-like Brix Pro line with Skylake models, or mini-STX (another of Intel’s pet projects) could actually take off. Both the Brix Pro line and mini-STX use 65W processors, which would provide a little more compute power. Either of those options would be a trade-off rather than an upgrade in performance, though. 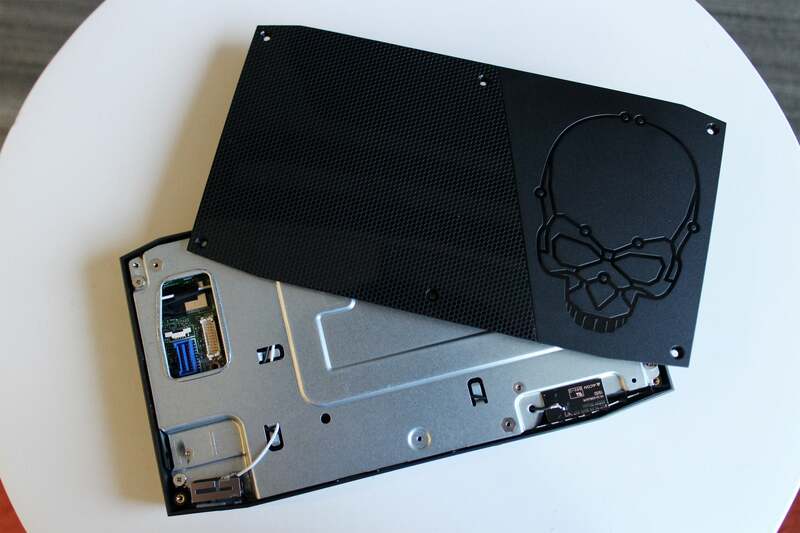 Neither can match the Iris Pro Graphics in this Skull Canyon NUC. On top of that, the Brix Pro line is infamous for its shrieking fans, while the slow start for mini-STX suggests it could go the way of thin mini-ITX. This Skylake Core i7 NUC, on the other hand, requires very little compromise. Paying top dollar should always result in having a fantastic computer, and that’s exactly the situation here. This completely revamped NUC raises the bar for what a mini-PC can do, handling both content-creation tasks and 1080p gaming with ease.